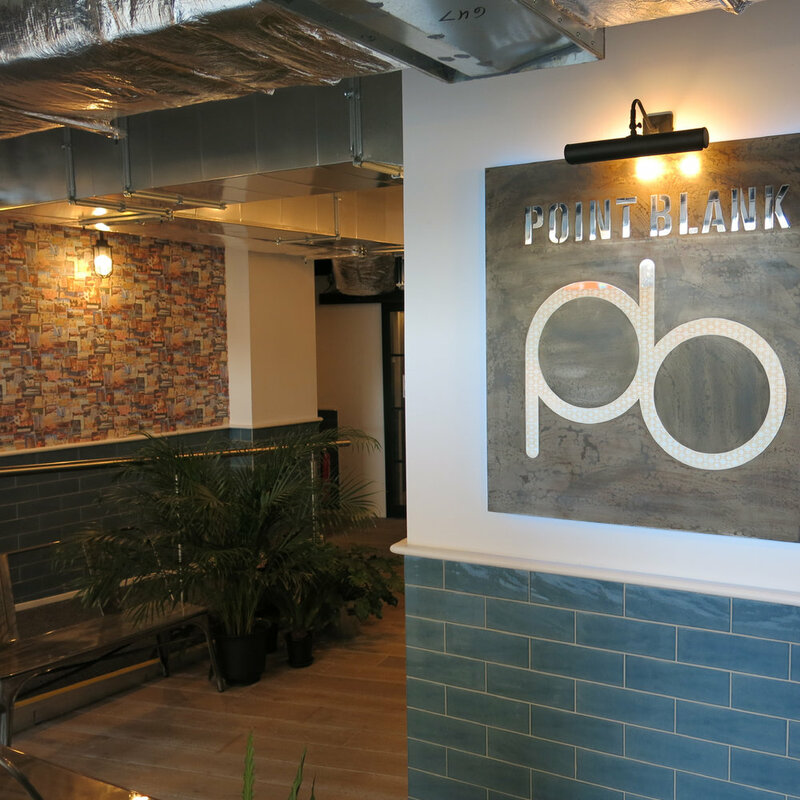 Scope of works: Acoustic drywall partitions and wall linings, plasterboard ceilings and bulkheads, firestopping, timber door sets, skirting boards and dado rail. 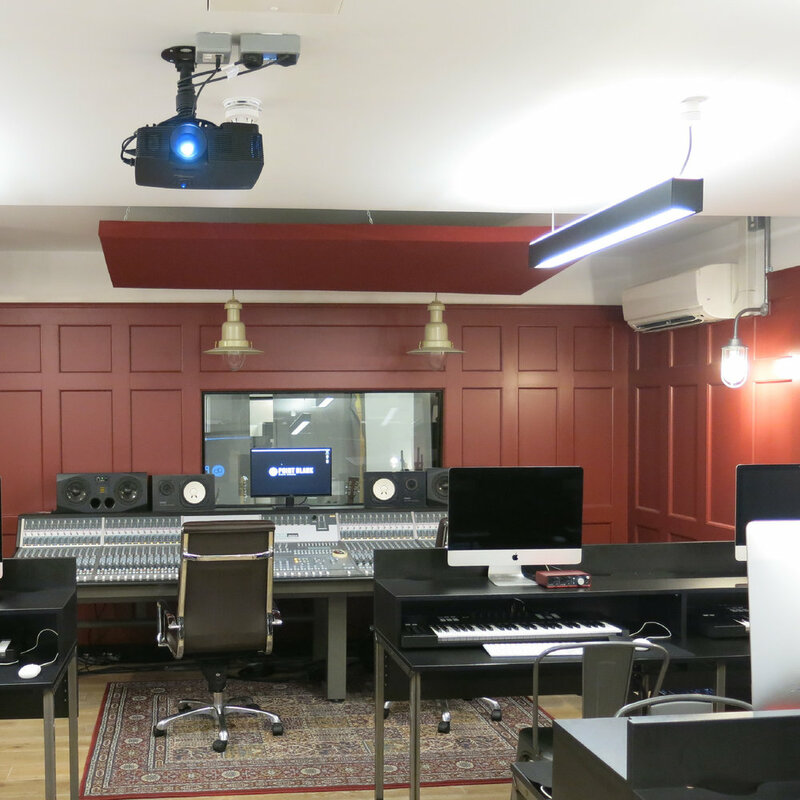 The Point Blank Music School project involved an electronic recording studio in Hackney London. Originally, it was one large open space with some circular roof lights in the soffit. 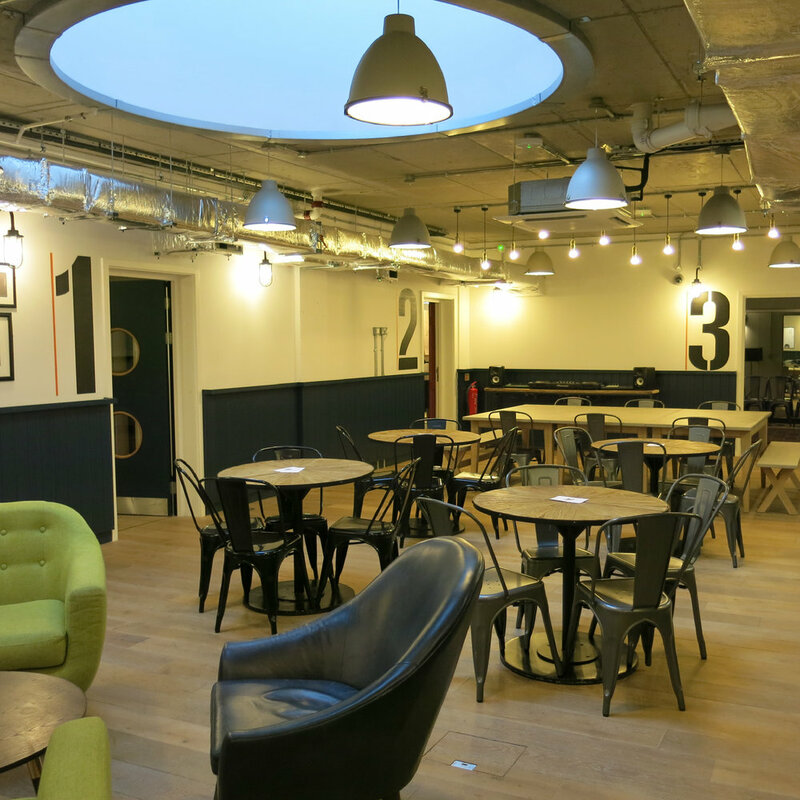 Our remit was to dissect the space into twelve recording studios, offices and a central meeting space. As this was to be recording studios, the acoustics were a priority. The build-up of the walls and ceilings reflect the high acoustic rating with multiple layers of British Gypsum Soundbloc plasterboard and Rockwool insulation. AD Contracts' first task was to line all the perimeter walls with drywall partitions. These partition walls were to be independent of the existing walls so that there would be no sound transfer from the new partitions to the existing walls. We built the partitions from British Gypsum Gypframe 60 I 50 I studs. These particular studs are robust enough to fix plasterboard to one side only without the wall flexing; whereas C studs require plasterboards to fix on both sides of the stud to give the partition wall strength. The I studs are also robust enough that no bracing was required back to the existing walls, which could have caused some sound transfer between the two. Between the existing walls and the new partitions we installed, Rockwool RW3 50mm insulation to also help with acoustic transfer and then we boarded these perimeter walls with two layers of British Gypsum 12.5mm wallboard. We then started to build the partition walls that would divide the space into the various studios and offices. For this, we used a variety of wall types dependent on the level of the acoustic rating that each room required. 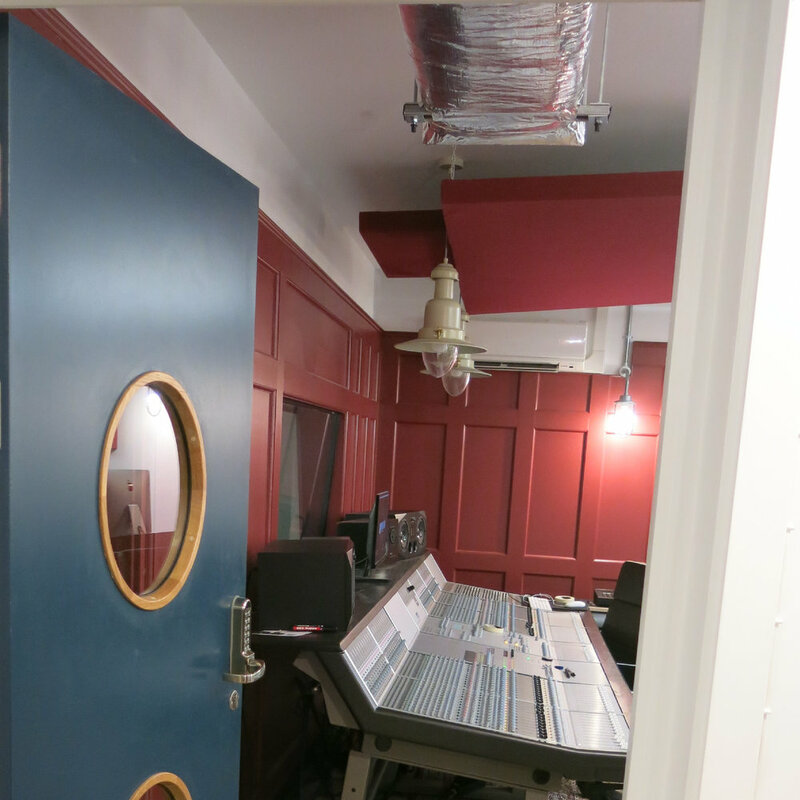 For the sound studios, we used British Gypsum GypWall Quiet IWL — this is an Independent twin frame high-performance, acoustic-separating wall system. This system has two rows of 60 I 50 I studs with 100mm Isover fibreglass insulation in between. On to this, we fixed two layers of British Gypsum 15mm Soundbloc plasterboard on each side. This procedure gave us a sound insulation of 70 (62) dB. Most of the areas had exposed soffits except for the recording studios, which all had plasterboard MF suspended ceilings. Again, the acoustics were very important here, so we used acoustic hangers to support the ceiling. The acoustic hangers have a rubber grommet that stops any sound transfer up the hanger and into the soffit above. The suspended ceilings had Rockwool RW3 150mm insulation laid over the top of them and were then boarded with three layers of British Gypsum 15mm Soundbloc plasterboard. All walls and ceilings had a tape and joint finish. We did this by spanning the skylight, first, with a Unistrut frame, and then by fixing our hangers from this to support the ceiling below. The timber door sets were all laminated with porthole style vision panels in them. All the door furniture was in stainless steel including kick plates and some coded locks. The skirting boards were all 100mm x 15mm square edge MDF, and we also installed an MDF bull-nosed dado rail in some areas. Once completed, the space we created had an authentic, contemporary look that would greatly appeal to the students using it.